Newly arrived during the night from her builders at Bristol, Clyde Marine's latest acquisition glistens in the sun after her passage up the Irish Sea. 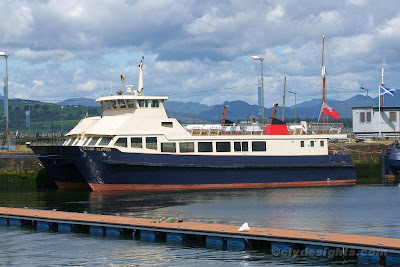 CLYDE CLIPPER is a 125 gross ton catamaran and will be able to carry up to 250 passengers. 28 metres in length, and 11 metres in breadth, she is fitted with two Doosan engines and has a speed of around 12 knots.